College Students Get 10% OFF! ATTENTION ALL STUDENTS IN THE INLAND EMPIRE! Is being a student finally paying off?? You heard correctly! Simply show your Coyote ID or another university or college student ID card and get 10% off of your Green Shack Deli purchase! 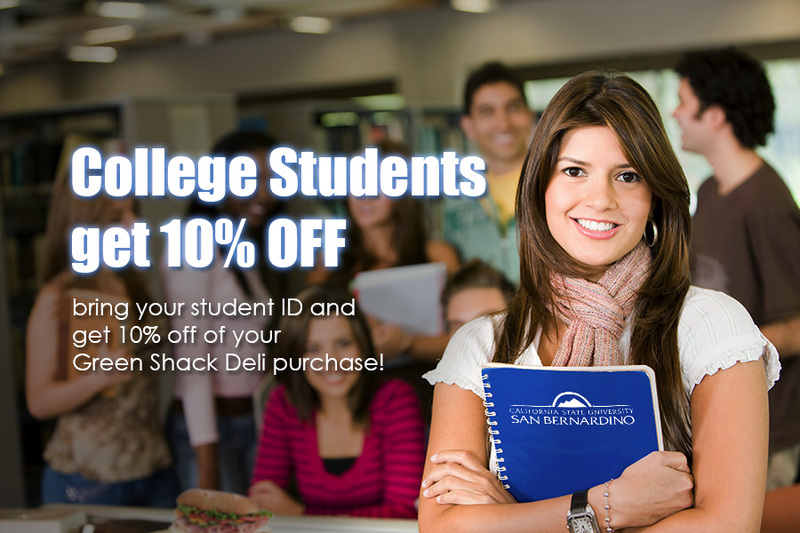 FINALLY students are shown a little love in San Bernardino with this new Green Shack Deli deal! If you show your college student ID, you can get get 10% off of your sandwich or meal! Who knew the perks of being a student would be so great! The Green Shack is there to make your college life that much easier! Check out our menu to see what you could be getting a 10% discount on!